You are here: Home / Shop PGH / What are the best local church bazaars? What are the best local church bazaars? One of my favorite events as a kid was attending the annual holiday bazaar at our church. While my parents shopped, I would sit in the Sunday School room crafting elaborate gingerbread houses, consuming just as much candy as I was attaching to my graham cracker abode. I have a vague memory of my dad telling me we need to leave and I was insistent that I finish my gumdrop landscaping project before my masterpiece was complete. If only I spent that much time today on the maintenance of my own home today. To let the thrift shoppers of Pittsburgh about the church bazaar scene. I know they are out there and very secretive about their favorite thrift shops. (I’ve tried to write a blog post about Pittsburgh thrift stores and a few people have begged me not to publish that list.) A serious thrifter should not overlook the annual bazaar in their quest for furniture, housewares, books and in some cases, amazing vintage clothing. 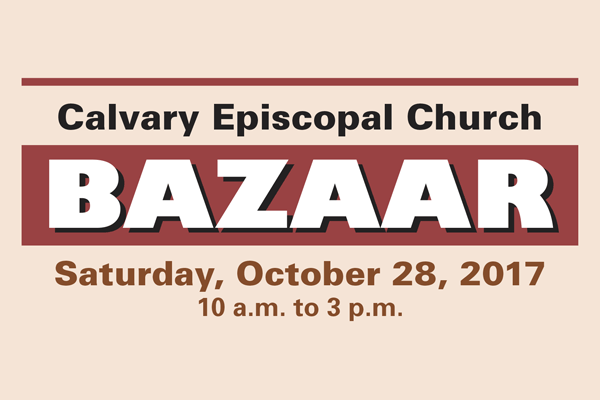 To remind you that the Calvary Church Bazaar is on Saturday, October 28, 2017. I know several of the volunteers and they have been hard at work to make sure this event is a success. If you have not yet been to Calvary Church, the building is worth a visit. The building was designed by architect Ralph Adams Cram and the stained glass was designed by Charles J. Connick. 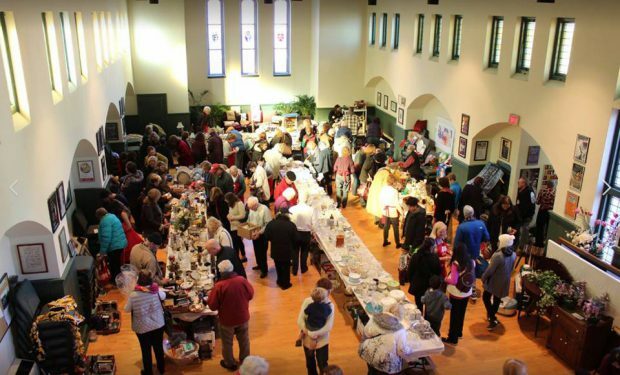 To ask for recommendations of other upcoming bazaars to shop this holiday season (and year round – I know that St. Aloysius Church hosts a rummage sale every month in their rummage house). I have renewed interest in church bazaars and rummage sales. A few weeks ago, I received a text from a friend about some sort of fall festival in Fox Chapel. I forgot about the text until she called me from the middle of a gymnasium surrounded by vintage chairs. “You might want to come over here, it’s crazy,” she said, “they’ve just marked everything 50% off.” I was on my way home for a nap, and decided I could make a detour across the Highland Park Bridge. I was in need of a new lamp and I had a hunch that a thrift sale in Fox Chapel might lead me to something more aesthetically pleasing than a lamp from ye olde Ikea. The Fox Chapel Presbyterian Church Harvest Fair, is much more than a fall festival. “Harvest Fair” is a bit of a misnomer for this event. It is in the fall, and it has the feel of a fair of joyous shoppers buying all kinds of things. The Harvest Fair has got to be one of the best places to buy furniture, artwork, lamps, housewares and more. It is one of the biggest church rummage sale events I have ever seen. My friend advised me to hurry, the sale ended in 30 minutes. I assumed I would be pulling into an empty parking lot and as I crossed the bridge I was questioning if I had just squandered my nap time for nothing. I arrived there in time for the last 15 minutes of the sale. The parking lot was packed and there were plenty of people still shopping. My friend was guarding a wooden chair, she had already put the bench she had purchased in her car. I got caught up in all of the excitement of this festival too. In less than 15 minutes I bought a couch for $8 (which they delivered to my house the next day for $30) and a marble lamp for $8. Following on the heels of our success in Fox Chapel, my friend and I have made a few other church sale stops since. The church bazaar is a great example of how Pittsburgh is changing. The church I attended as a kid no longer has a holiday bazaar. At the same time there are many great handmade and vintage markets happening all over the city. The popup market is one of the reasons I’ve become interested in how to re-purpose old church buildings. One of the most popular posts on this blog is the post about Pittsburgh wedding venues. One of the questions I am frequently asked is where is an affordable venue that can hold several hundred people. Many of these churches were built to serve as community centers, with have kids rooms and kitchens. To prepare and serve food to the public, you have to use a kitchen that has been certified by the Allegheny County Health Department. Many churches have an industrial kitchen that is inspected by the health department (and often under utilized). There have been some church reuse success stories for churches that have closed and some churches that are still active. The Union Project in Highland Park had been abandoned for years and thanks to some neighborhood volunteers it now functions as an event venue, office space and ceramics studio. East Liberty Presbyterian Church runs Hope Academy of Music and the Arts, which offers art and music lessons to kids from all over Pittsburgh at an affordable cost. I would love to see some popup restaurant events take place in local churches. Know of other holiday bazaars or church rummage sales? Please share upcoming events in the comments below. I would love to learn about other examples of how older community buildings are being reused in Pittsburgh. If you are looking for a Halloween Party to attend, New Sun Rising is hosting a Halloween Party in the Millvale Moose building which they are converting to a community space. If you love vintage clothing and housewares, the Pittsburgh Vintage Mixer is next weekend at the Teamster Temple in Lawrenceville.